I had been contemplating what to write in my next post for the MNSIndieProject for months now. One idea this week, another next week, and it kept happening for so long. Even today, when I thought that no matter what, I will start writing the next post I had thought of something else, but when I was staring at the blank document, with some new age pop tunes playing in the background, nothing really struck me. But thankfully, I have a playlist which fluctuates from 60’s Bollywood and English music to new age music from many varying genres. And owing to the same, a melodious tune suddenly started playing on the speakers, replacing the crooning which I wasn’t paying much attention to. I needed a bit change of pace I guess. With this change of tunes, my mind decided to change as well! I finally accepted that I need to let myself write whatever comes in the flow, but just start somewhere. I had been holding myself back, trying to get “The Perfect” theme for this post. And not just this, I have been doing this, the-holding-myself-back-till-I-get-the-perfect-solution thing, for months in every sphere of my life and I realized a lot of this pressure has been self-imposed. Thankfully I realized this in time! It’s a matter of satisfaction and it is always relative for everyone else. At this point in time, I have decided that it is okay to NOT be perfect about everything. And it feels like the right thing to do. Not that pushing for the perfect solution to everything is a bad thing, I did it because at the time that’s what made me happy. I have to look forward and climb life’s steps in my own pace. A big cheers to growing on our own pace. There is enough of pressure to do things which we are not always comfortable with, let’s not impose more on ourselves, by ourselves. It is okay to not get the perfect picture, from the desired angle. It is okay to get a little less raise and have more peace of mind, it is okay to pass on buying those shoes, you were not going to wear them anyway, and it is okay to …….. I would love to share your life experiences from my next blog post onwards. It can be about anything, I will share them anonymously, if you wish for it to be that way! Mail me on priyanjanamns@gmail.com . 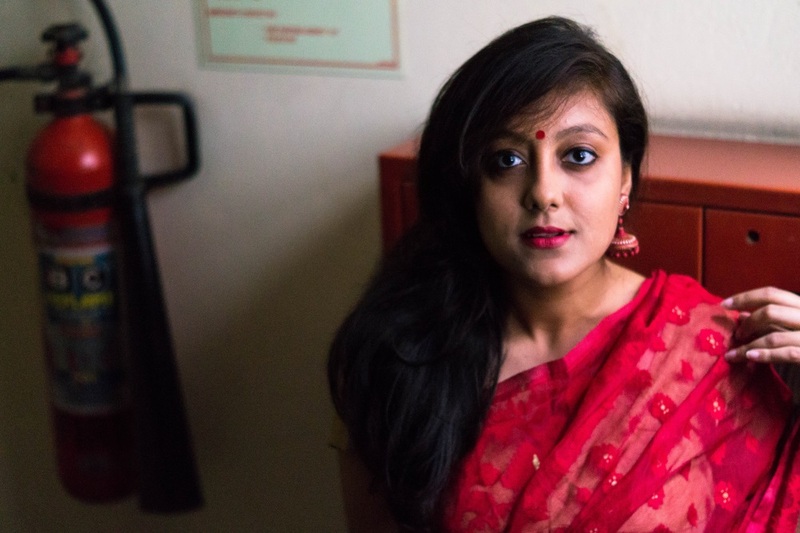 Now the focus of the MNSIndieProject today is a beautiful Dhakai. 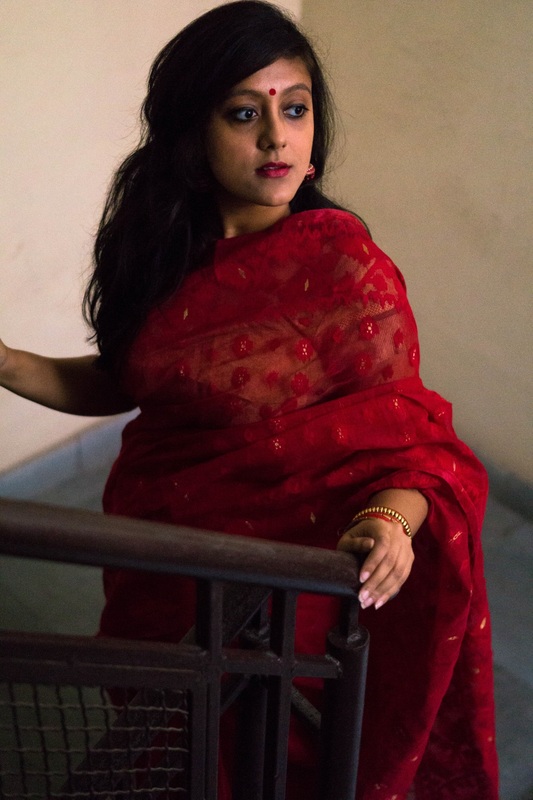 Now let me tell you why I have chosen a Dhakai, a saree originally weaved in Dhaka, the capital of Bangladesh, to be a part of the #MNSIndieProject series. 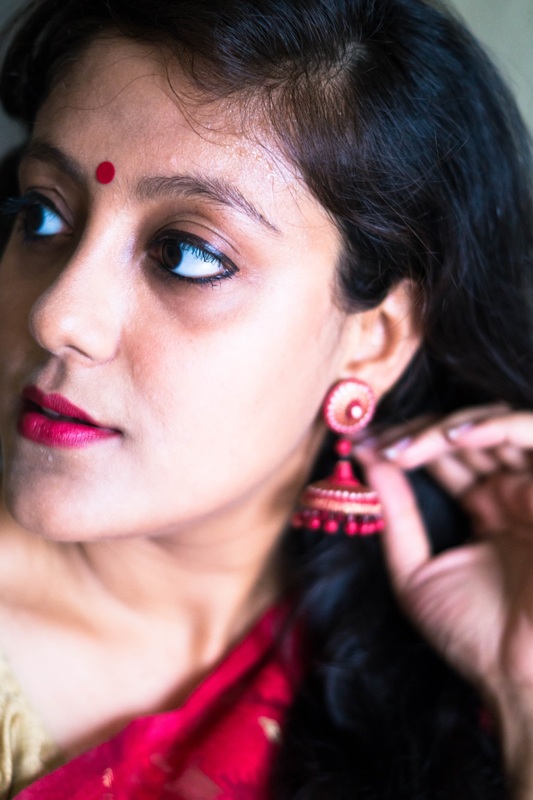 Even though the Dhaka, doesn’t fall under the Indian Territory anymore, this weave that comes out of this place remains a hot favorite for women across the world and India. 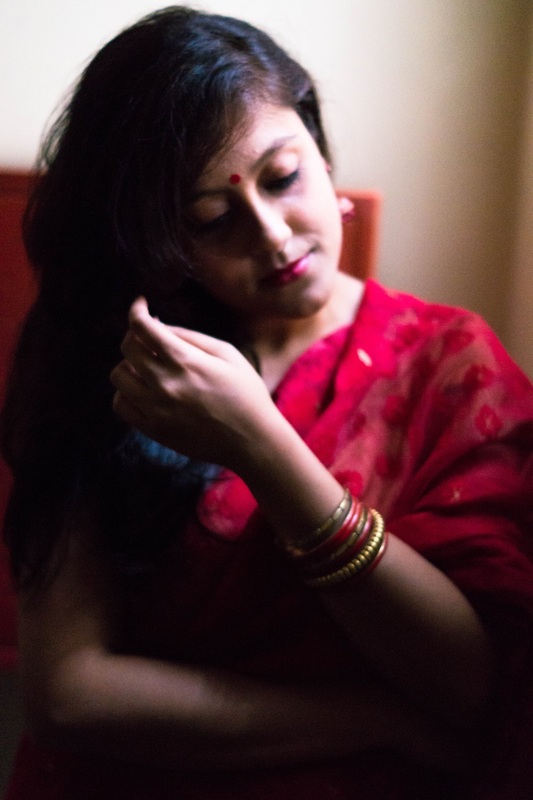 The Dhakai Jamdani weave is a very old and delicate one and the sarees are delicate as well, because of the fabric called Muslin, which needs a lot of patience to be weaved and worn with grace. My Mother personally loves collecting this weave in particular. 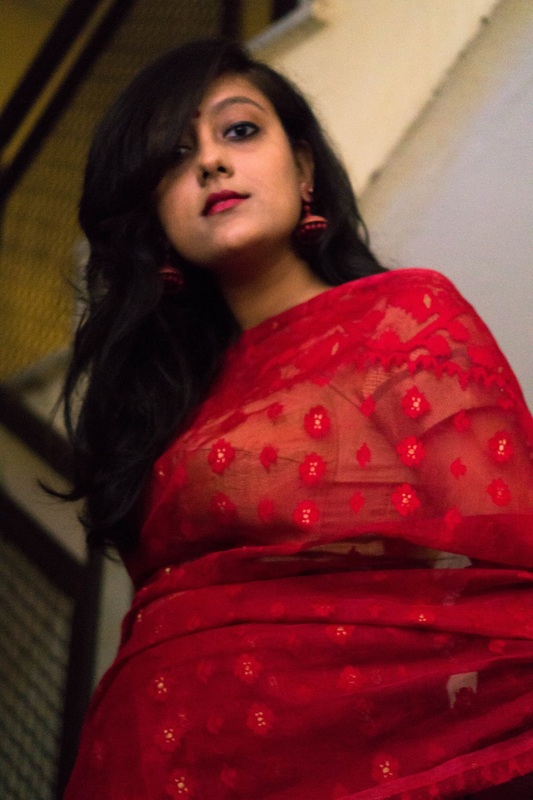 So I have access to multiple colors and designs of this particular type of saree and I picked my favorite for this one. 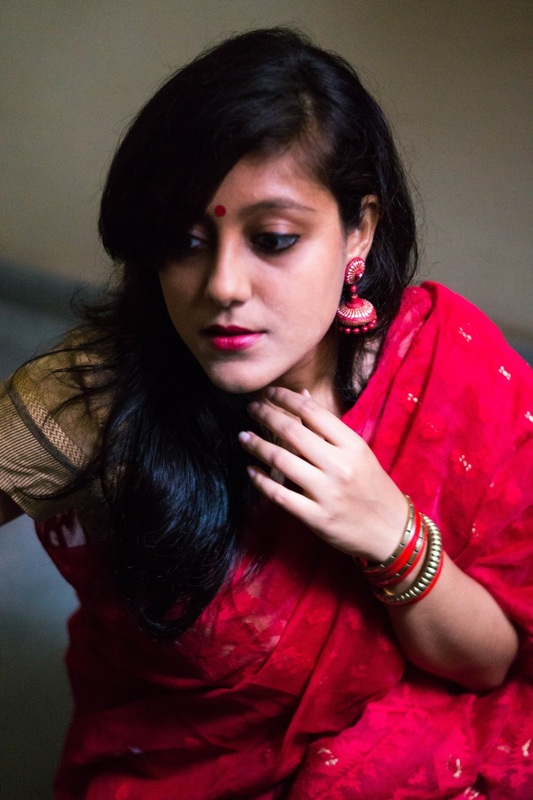 A single color red dhakai, which I had been eyeing since forever! 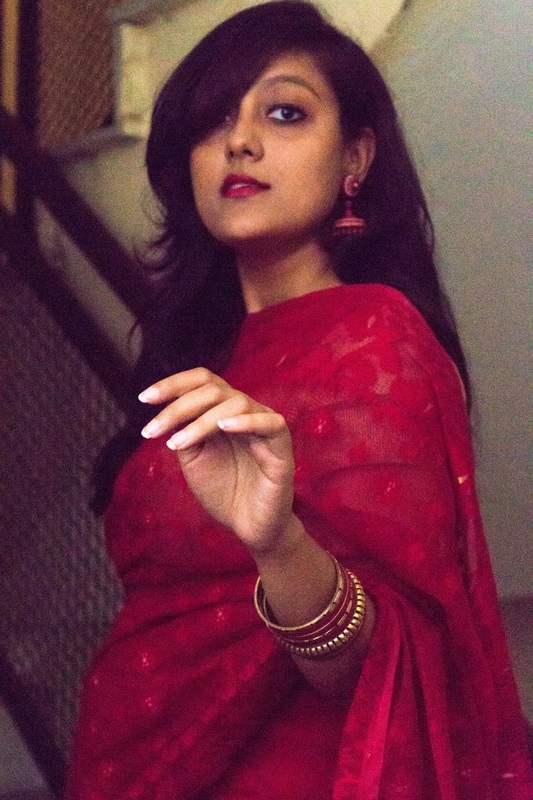 Why, because red is the color I love! I will be turning a year older this season of lions. and us lions prefer to show everything we are simply and the color red does that for me. I am not going to talk much about the weave in general, keeping in mind a bit of the #MNSIndieProject baseline. Just that, that this weave is beautiful one and deserves a lot of attention. 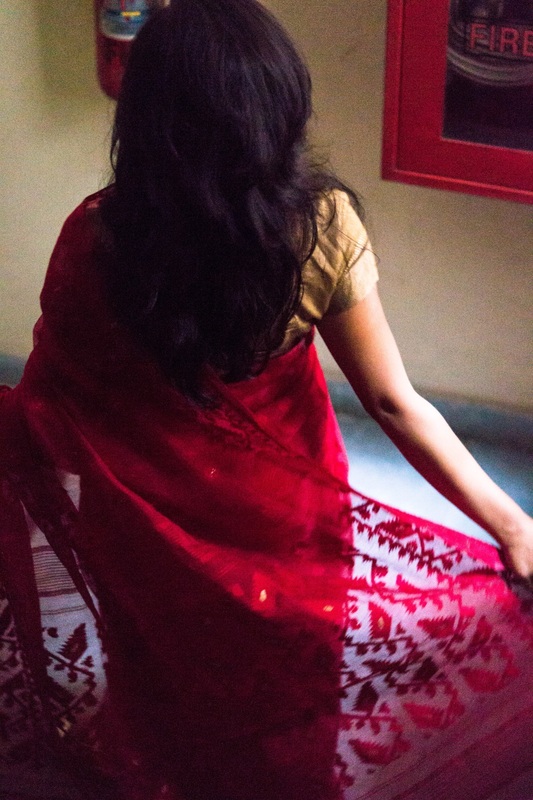 There a lot of machine weaved sarees, the ones that come off of the handloom have a distinct thing about them. Look out for those to get a perfect one for yourself! Have you read the other MNSIndieProject posts? Let me know your views about the series in the comments! Would really appreciate it!